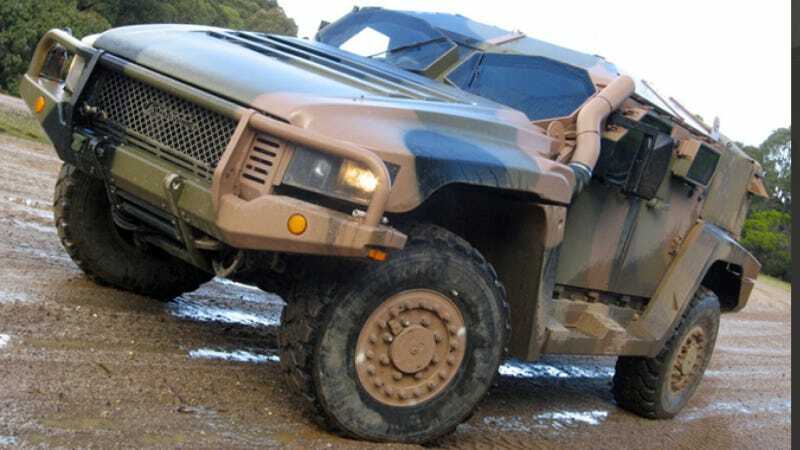 The Australian car industry might be running out of juice, but Down Under military machine manufacturer Thales is still determined to represent what the country can do in manufacturing. The Aussies had a full-on truckgasm last weekend they witnessed a Thales Hawkei, one of the Australia's newest and sexiest military vehicles, run as the pace car in this season's penultimate V8 Utes race. The Hawkei is not yet in official production, but is expected to start rolling off the assembly line soon. Thales developed the truck in conjunction with Boeing Australia, Israeli Armorer Plasan and Russian engineering outfit PAC Group. The Australian military is reportedly planning to replace their Land Rovers with 1,300 Hawkei trucks. Hawkeis are powered by Steyr 3.2 turbo diesel engines and ZF transmissions. They can carry four to six people depending on configuration; every one of which is pretty darn cool. But the most interesting feature might be its adaptable ballistic protection— which can be installed or removed with no tools in thirty minutes. The purpose of taking the armor off at all being for air transportation, and increasing fuel economy and payload capacity when taking fire is not a concern. Fun fact: "Hawkei" is not a wacky way to spell "Hawk Eye," the truck is actually named after a species of Acanthophis hawkei or "common death adder" snake. That snake is named after former Prime Minister Bob Hawke, who ran Australia for most of the 1980's. Thales is the same outfit that supplies the Jamaican military with the mightiest machine in their motorpool— the Bushmaster.